Although it may not feel like it with all this icy weather, the warm weather is just a few months away, and the spring collections are beginning to roll in. 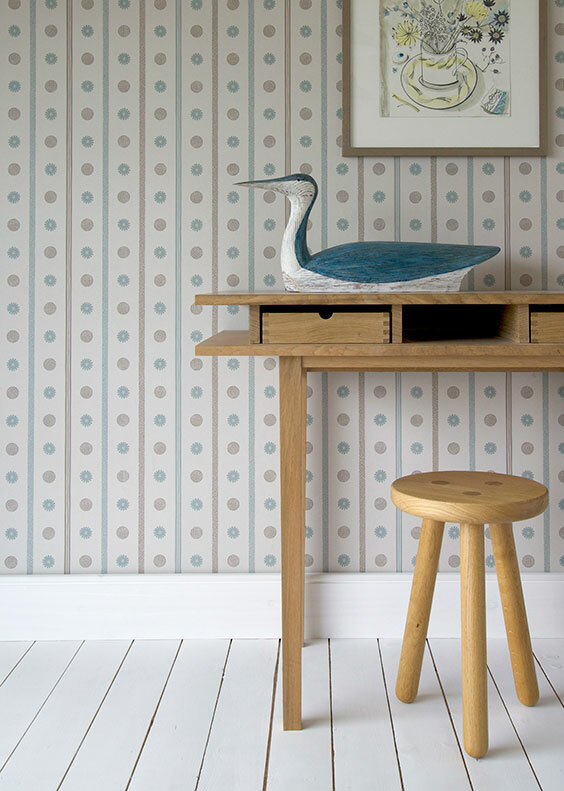 The new collection from Travers, ‘Love Letters’ is a wonderful array of fresh and light patterns and colours, and couldn’t be more perfect for spring. The collection as a whole pays homage to original Travers brand and style, as well as classic American design. The bright and snappy colours are met with elegance to create a truly wonderful assortment to fill your home with. 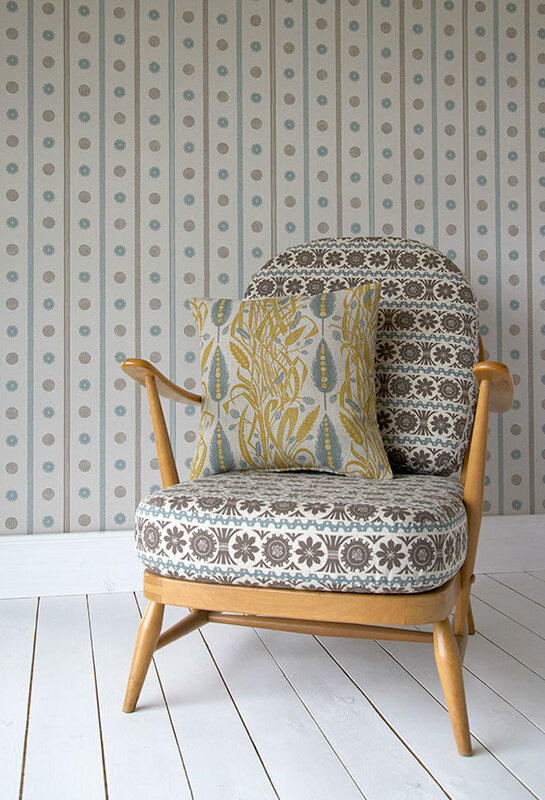 This vivacious Beaumont Indienne fabric is the definition of an eye-catcher. The vivid colours and lines give a modern twist on an iconic style, which make the fabric ideal if you like to add a little of the old and the new to an interior. 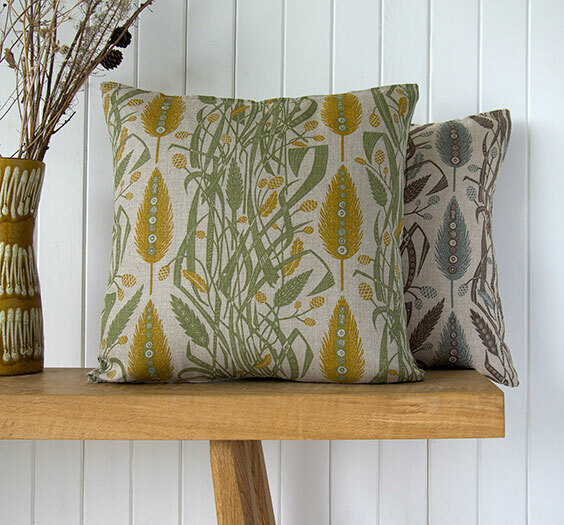 Here it is matched with the fantastic Sausalito pattern, which is used as a more neutral canvas to house the punchy Beaumont Indienne design, but its mid-scale pattern still manages to hold its own, without the whole look being too overdone. The nature of Emperor’s Seal reminds me of the laid-back, open plan room decorated in a low-key, comfy minimalist style that you might have seen in a design magazine from the nineties. The Chinese calligraphy, just a few shades darker than their background, are an interesting touch to neutral fabric, and is the sort of detail that adds a distinct sense of luxury. Paired perfectly with the Temple Lattice curtains, the burnt orange gives the whole look a sophisticated pop of colour. The glorious St. Croix fabric adorns this headboard to create a bold, feminine look in a bedroom, the birds and florals bursts out against the pink, and with a little additional piping the whole ensemble is really superb. A hint of texture is provided by the Mason Diamond fabric used for the throw and the crisp white teamed up with the array of pinks give the room a sweet and charming look. The rich and textural Vermicelli fabric has a wonderful mixture of both contemporary and traditional aspects. The pattern is modern way of presenting a regal style, and the velvet and interesting colourways means that the fabric can be used in a contemporary setting, or used to update a traditional piece of furniture like the chair above. You may think using an intricate design like the Vermicelli with another pattern may make the fabric lose a touch of its elegance, but the royal stripe of the Belle Meade creates a perfectly curated look. The snappy green colourways from this photograph show how to do classic styles in an unexpected shade. The textural Astor Velvet used on the seat of this antique chair gives an idea of how to keep a harmonious look throughout a room whilst still including antique pieces. There’s an Art Deco touch to the Lamour curtains, the sultry gold intertwines wonderfully with the mossy green, making a glamourous display, proving that you needn’t just use dark hues to create a rich and romantic interior. The Beverley Velvet has a touch of retro style to it, the wavy pattern almost melts onto the sofa, giving it a laid-back seventies vibe, which is perfect for adding some relaxed but smart style into a room. This fabric is perfect for giving a little flavour into a modern, contemporary space. Another absolutely charming design from the collection is this rich but sweet pattern, Cloisonné Embroidery. It’s a rather special deign and if you like to go bold with your interior choices, this should certainly be up for consideration. 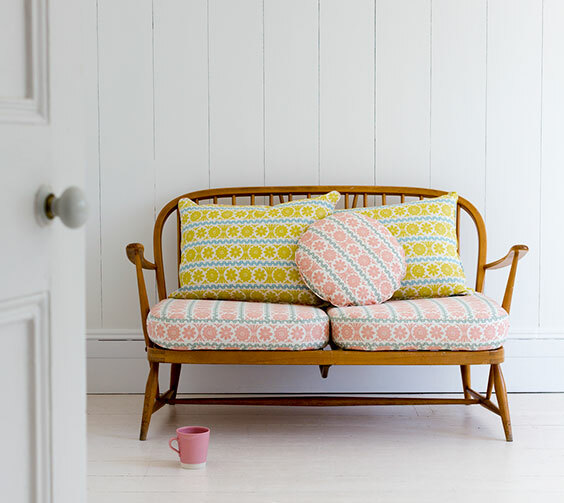 The vibrant pattern maintains a feminine and soothing tone about it, which means the large pattern isn’t too overbearing for a room and instead will settle into a scheme in a natural fashion. Next up is a playful take on traditional Chinoiserie, Happy Dragons is a fantastic pattern if you want to have a little fun with your style. The design has the perfect combination of whimsy and elegance, and mixed together with some fabulous colourways, the design is a must-have for contemporary schemes, or traditional ones that are in need of a bit of an edge. Finally, for hint of vintage Miami, this look is fabulous. From the limey greens of the Catalina Stripe to the limber paisley style of the Balboa Paisley, which could almost be mistaken for palm leaves, everything about these fabrics gives off a laid-back American coastal feeling. Everything about this collection is calm, cool and collected glamour, in this vibrant array of designs there’s something for everyone, the only problem you’ll have is choosing your favourite! We recently saw the new collection Carlyle from Travers and we absolutely loved it. There is a wonderful mixture of elegance and understated luxury, eye catching pattern and delicate colours. They have also produced some superb lifestyle images to show the collection off – here are just a few to wet your appetite. 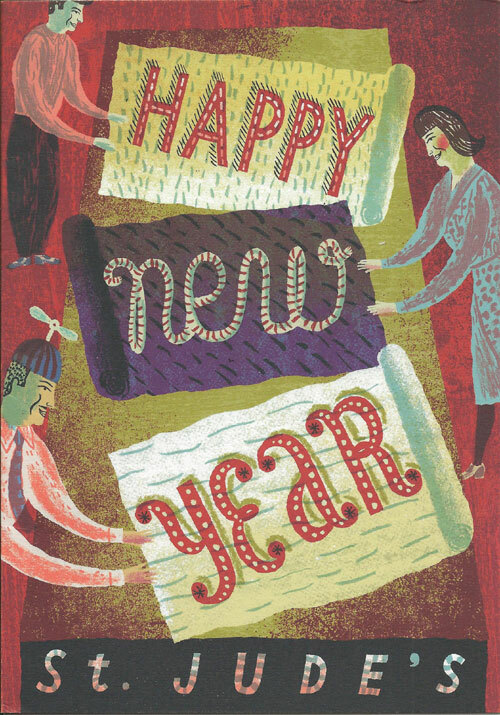 What could be nicer than receiving a fabulous Happy New Year card from the wonderful people at St Judes enclosing these beautiful pictures of Angie Lewin’s lovely new fabrics and wallpaper – as I am now running out of adjectives, I will let the pictures do the talking BUT I will just say that the card is by the brilliant Jonny Hannah. That one isn’t going into the recycling bin any time soon. Have a good weekend everyone.